The Bobbilicious Files: Too Sparkly? Nah! Last week I couldn't sleep, so I just snuggled under my covers and thought about things. I wondered how I didn't have any pins to glue on the back of the shrink plastic dragon I'd made when my stash of supplies is so big and varied. 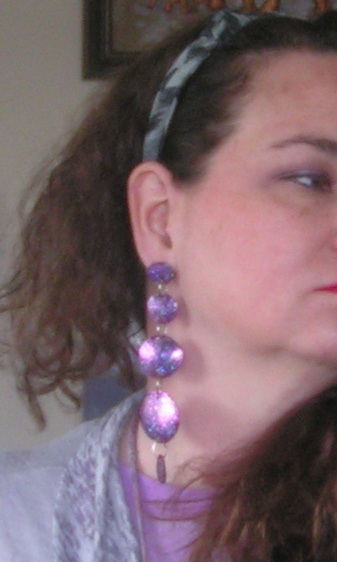 Then I thought about other things that could be made with the shrink plastic and how they could be made and decided to experiment with earrings. The next day I found some round things to trace and a purple marker. I made a bunch of different sized circles and colored them on both sides before baking them. The color wasn't quite as strong as I'd hoped, so I got out the glitter nail polish. I used three different polishes to get a look that was perfect. I super-glued some posts on the back, linked the circles together, and voila! 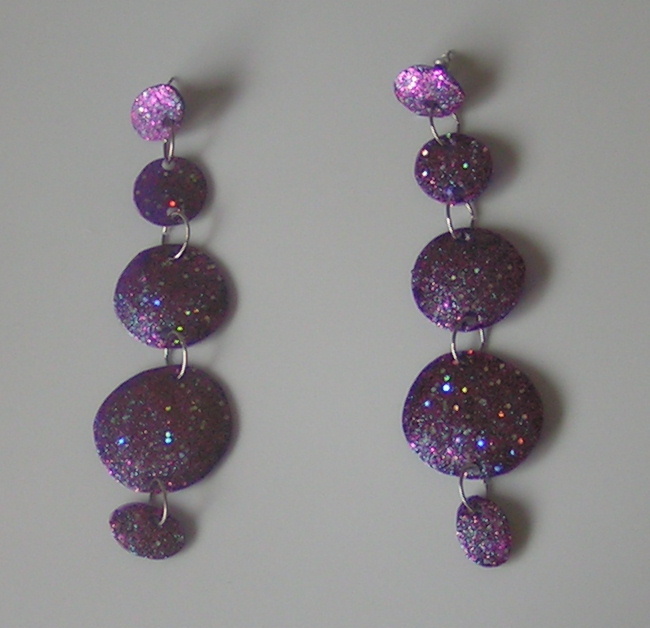 Of course, I have tons more ideas for big, sparkly earrings now. I have a place to work, too, so I don't have to clean up my mess to fix dinner or anything. The ideas will have to be written down and sketched for now, though, because I seem to be developing the hereditary arthritis in my hands. It's not a good time. Last night I could barely turn a door knob. I won't stop doing what I do, though, because I would probably explode in frustration. There are too many things to make for me to just give it all up. When I'm hurting a lot I enjoy an old movie or two and admire the brilliant actresses of the 30s and 40s - and not knitting while watching means that silent movies are easier to keep up with because I read all of the cards. Well, I'd better get going. Joshua seems to be up to no good. He's got spring fever and can't keep from climbing the screens to try to chase the birds and squirrels. I'd better go get him before he gets stuck somewhere. The earrings are fab-I wish I could tolerate the smell of nail varnish, but it is a trial just getting some onto my toenails. Too sparkly? Is that even possible? My brain can't wrap itself around the concept. :D Seriously though, I absolutely love glitter, shimmer, shine - you name it - and am swooning over your awesomely pretty purple earrings. From the size to the triple segment design, they're glam, gorgeous and definitely not "too sparkly".